May has arrived and so has spring in upstate NY! This month’s querent is a woman we will call “Tara”. She is awakening to signs of a quest are blooming all around her. Tara has been struggling to find a way to express her creativity through work. A very spiritual person by nature, Tara has been receptive to signs all around her that are urging her to pursue a personal quest. She has asked for help identifying the nature of her quest and preparing for this life transition. The first card selected is the only Major Arcana chosen in her reading. 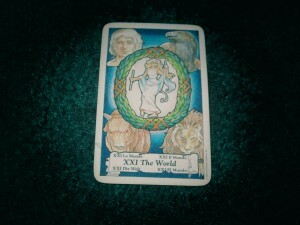 It is the World card and is the final card in the tarot deck. The World is significant and indicates Tara is in a pivotal phase between accomplishment and new beginning. Tara may be experiencing internal restlessness knowing life has brought her opportunities to excel and advance, but that she has taken her past experiences to their maximal conclusion and a major change is just on the horizon. Like a college senior in their final semester, Tara is on a quest to gain the tools and knowledge she needs to advance herself and will then be called upon to launch her new identity and develop her new lifestyle. She will have to make some sacrifices for this quest. It seems that were things to stay as they are, Tara would be recognized as competent, capable….but stuck. It is going to become more and more evident to her that she has outgrown her surroundings and even some aspects of her identity. In particular, there are four qualities; the four elements, four talents, or four interests, that Tara has developed mastery over and now needs to harness, balance and combine to launch her new lifestyle. Her quest involves honing in knowledge and interests already developed, but further refining, polishing and presenting them to others. Likewise, her passion and motivation has carried her far but at this stage the quest is asking her to channel this motivation to back up the message and knowledge she carries. Her emotional and nurturing side will help her cultivate relationships in this new aspect of her life and it will be important for her to moderate intensity of her desire with the finesse to draw the influence of others who will help her start this new phase of her journey. Finally, the fourth quality, the stable, grounded and structured framework which Tara must remain connected to in order to see her new lifestyle blossom. It seems balance and coordination are indicated. Tara is being asked to expand her horizons and will have to modify her expectations, continually rebalancing these four qualities along the way to show her best capabilities and develop her fullest potential. The quest will have come to full fruition within three years. The first phase is the gathering of awareness and information, the second is collaboration with others and this phase may require some compromise and sacrifice of personal vision to embrace the power of opposites, the third phase will require movement, action and expression of her creativity through the mundane world. The final phase will involve transcendence, movement above and beyond what she had initially expected. She is also facing a significant ending, as all major beginnings must first see the clearing away of previous structures and framework. There may be aspects of the quest that will show Tara what potential lies before her so that she will not need to give such power to elements of her current routines that bring security and stability. She awaits opportunities for expansion and growth on a significant spiritual level although this will be enacted through her work in the mundane especially in nurturing four paths or four talents. It seems the time has come for Tara to embrace expansion by harnessing four talents or four influences in order to promote abundance in her new path. 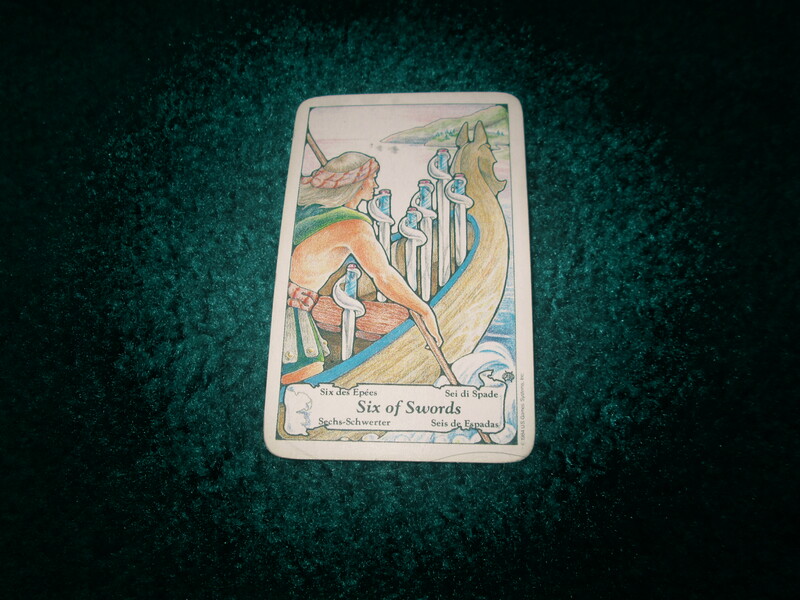 The next card is the Ten of Swords. 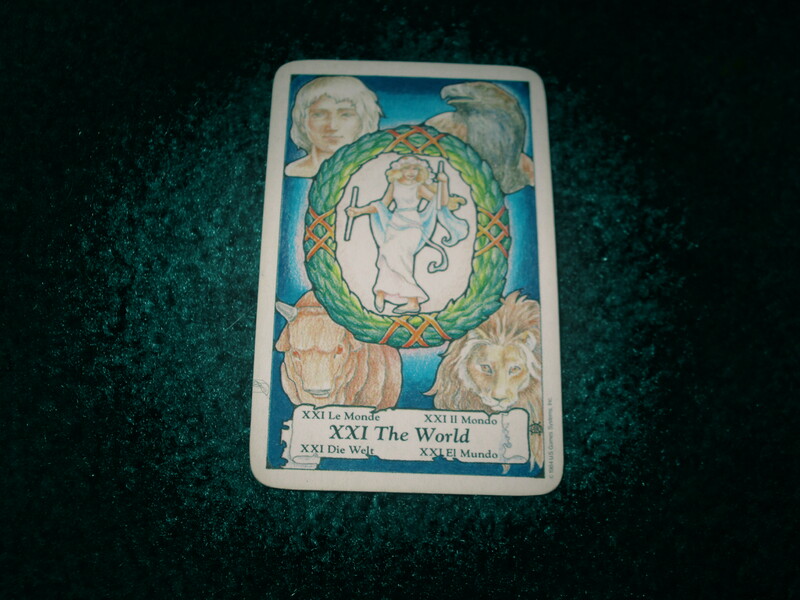 This is drawn to indicate a helping or guiding force and this card shares the significance of ending, culminating events or finality indicated by the World. The variation here is that mundane situations and people on the physical plane are represented and the indication is finality, but also rest, compromise, and a necessary albeit difficult termination. Tara has faced a long journey recently but her many hardships are also guiding forces in disguise. Amidst her trials she has found connections that have helped to motivate and prepare her. She will soon face a pivotal turning point. It will arise out of an ending or completion which feels exhausting and may even feel like a failure or defeat. Tara would do well to refrain from thinking in terms of loss and defeat. She has not lost, she has simply discovered that many of her previous pursuits brought more challenge than reward and she will be given the opportunity to put to rest a burden that she has long carried. 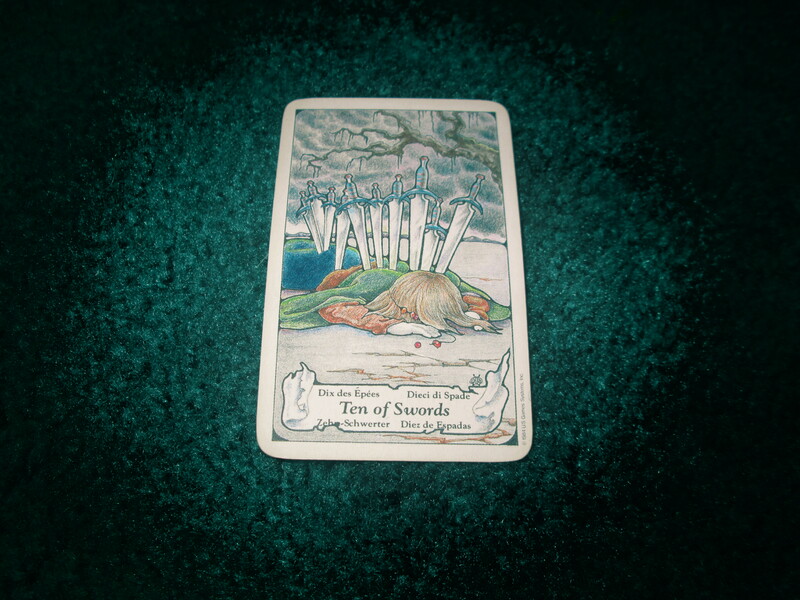 Closure is needed in order for her new beginnings to emerge but this means laying down the burden of strife, and resolving acceptance of where she stands and what she has accomplished and gained in the process. From this point she will be helped by an honest and open confrontation of her inner demons. An appraisal of her strengths, weaknesses and motivations will be necessary. This quest may also present more guidance and help from subtle, unseen or receptive sources than projective, active, tangible ones. By remaining open to the synchronistic opportunities even if they do not fit her plans at first, Tara will be guided and helped along her path. Those of a fiery temperament or active, inspirational, passionate nature will also be likely allies. There may be one particular friend or acquaintance who stands out as a significant assistant helping Tara to unburden her spiritual and physical load. The number ten will also be important. Ten months may be required for this path to unfold or the numbers ten or one surfacing along the way should be considered significant. The culmination of past actions will bring closure rather than bearing desired fruit, yet this closure is what will allow transcendence, moving forward having learned lessons stemming from long past. A release will be found in this quest, relief of a burden, happiness that a difficult trial has resolved. Helpful forces exist along the way but the overall theme is lessons through recognizing the role of choice, action and will in both creating and overcoming hardship and difficulties. Lessons from the past pave the way for the future. The spirit needs to be recharged and refreshed in order to pursue the future free of past burdens. It is advised that Tara attempt to use the imagery of fire to cleanse and clear past negativity, preconceived notions, and residue both from spiritual, personal and mental space. Tara would do well to close the door on the difficult path of swords by allowing herself to shed the skin of the fiery suit, allow the closure of the ten of Swords to return her to the vigor and energy of the Ace of Swords, the essence of motivation and action, that her spirit will be rejuvenated and move to the next phase in progression, the physical, earthy manifestation of Pentacles. 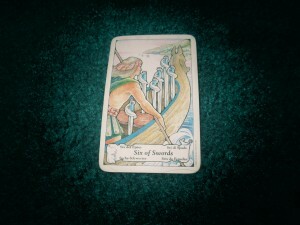 Finally, in looking for the source of challenge along the quest, the Six of Swords is drawn. It seems a resolution to a long standing issue is on the horizon, a journey now represented in somewhat physical forms- travel, change of scenery, movement and setting sights on new horizons all in the effort to start over renewed. It seems Tara will be accompanied by loved ones or at least will journey with their support. It seems that a change of scenery across or alongside water brings a brighter future, a positive resolution found by change of scenery and atmosphere. Tara may feel as if she is shortchanged or compromising, but it seems this is a necessary step in releasing her from the tension of the path she has been on. There may be some difficulty involved in travel or fear of unknown or unfamiliar surroundings that at first prohibits Tara from accepting this change. The Six brings resolution, relief and reconciliation. A reconnection to her personal past may be indicated here as well, even a compromise that allows her to heal connections to past friends or family so that she can continue into her future with full healing and reconciling of differences. Taken in total, it seems Tara’s quest is here to bring resolution and closure and so a natural grieving process may be taking place as Tara moves farther away from her past measures of security and identity, allowing the foundation she has laid and lessons she has learned to help her accept a change of scenery involving some compromise in plans or expectations but overall accomplishment and momentum forward where she has recently been stuck in transition finalizing one phase and awaiting another. Best of luck to Tara on her quest. Remember, no matter where you are reading this, in accordance with NYS law all readings are intended for entertainment only. Interested in being the Querent in next month’s column? Contact Angela at Trionfi78@gmail.com. Angela Kaufman has been exploring divination through Tarot cards for over a decade. She is a Certified Professional Tarot Reader and formed Moonlight Tarot in 2009 which would become Moonlight Tarot LLC in 2010. Angela uses the Tarot to assist clients in exploring personal growth and development, and in accordance with New York State Law offers readings for entertainment purposes. Angela began providing readings on a professional, “Moonlighting” basis in order to provide affordable readings to those seeking guidance, inspiration and fun. Angela is also co-author of the new book “Wicca, What’s the Real Deal? Breaking Through the Misconceptions.” (Schiffer Publishing, 2011). In 2006 she joined ISIS Paranormal Investigations and has accompanied the team on numerous investigations in private residences and businesses throughout the capital region, Adirondacks, Vermont and Massachusetts. Want a chance to get a live Tarot Reading? Check out www.cafenolany.com for listing of Tarot events at Café Nola in Schenectady NY!